A machinist at AccuRounds in Avon, which has a labor shortage that vocational schools could help eliminate. Many vocational and technical schools across Massachusetts have long waiting lists for students seeking admission, creating a bottleneck in worker training even as thousands of well-paying jobs go unfilled for lack of skilled labor, according to a new survey. The survey, conducted by researchers at Northeastern University School of Law, found that at least 3,500 students were unable to get into public vocational schools in the past two years, with the longest waiting lists in communities with high unemployment and large minority populations. In New Bedford, where the 10.5 percent jobless rate is nearly double the state average, the Greater New Bedford Regional Vocational Technical High School turned away more than 500 students because of lack of capacity. In Springfield, where unemployment is also 10.5 percent, the Roger L. Putnam Vocational and Technical Academy had a waiting list of more than 300 students. Diman Regional Vocational Technical High School in Fall River had a waiting list of more than 200 students. The unemployment rate in that city: 10.1 percent. 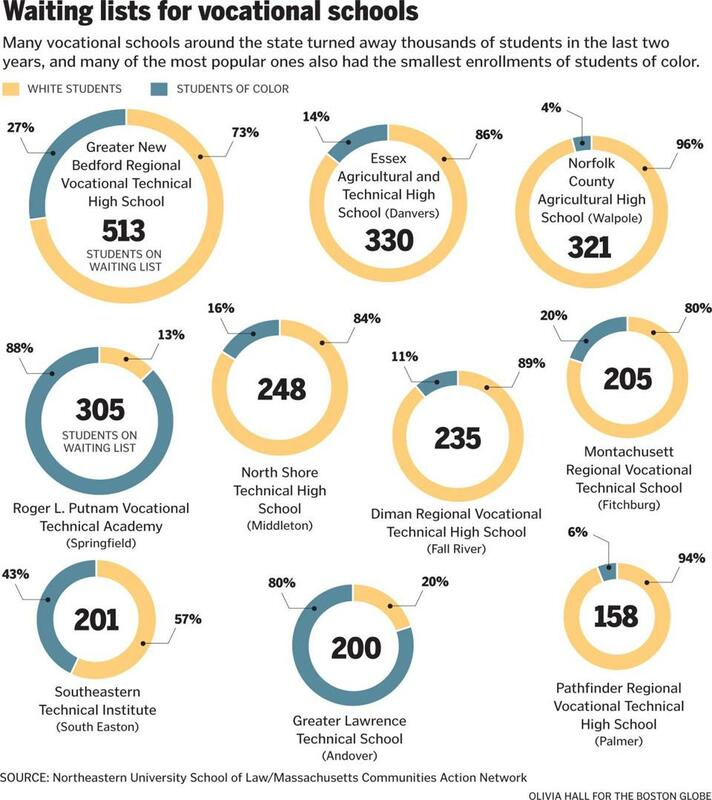 About half of 66 vocational and technical high schools in Massachusetts responded to the Northeastern survey, which collected wait list information, including racial and income data, from 2012 or 2013. Of the schools that participated, 21 had waiting lists and 10 did not. Labor market specialists refer to the problem as the “skills gap,” in which the skills of the workers don’t match available jobs. 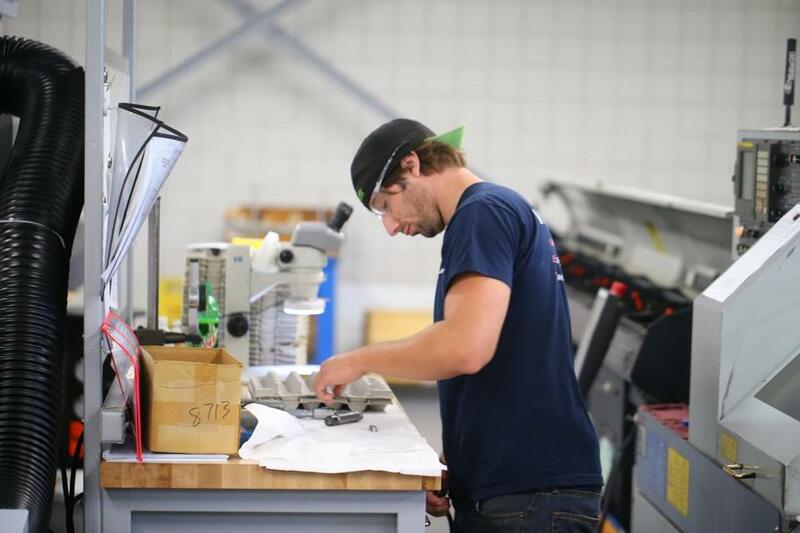 Many business leaders say the failure to train enough students for skilled work in industries such as manufacturing and health care hurts the ability of Massachusetts companies to compete in the global economy. AccuRounds Inc., a manufacturer of precision parts in Avon, recently expanded into an 18,000-square-foot addition as its exports to China and other international markets increase. But Michael Tamasi, the chief executive, said he can’t find the workers he needs to keep up with the company’s growing business. The jobs, as in most of Massachusetts manufacturing today, require mastery of sophisticated equipment and digital technology, and Tamasi is willing to pay for the skills, offering as much as $30 a hour, health care benefits, and a 401(k) plan with a company match. In the past, he has relied on students graduating from Southeastern Regional Vocational Technical High School in South Easton, but there aren’t enough of them. Manufacturers face even worse labor shortages as baby boomers retire. A 2012 Northeastern study estimated that more than 100,000 manufacturing jobs would become available in the state over the next decade. But workforce development specialists stress that shortages of skilled workers won’t be confined to manufacturing. Linda Noonan, executive director of the Massachusetts Business Alliance for Education, a nonprofit business group and longtime advocate for school reforms that better prepare students for jobs, surveyed 334 Massachusetts employers earlier this year and found that 69 percent of those responding experienced difficulty in hiring employees with the appropriate skills. She noted specifically a lack of training for middle-skill health care occupations, such as nursing assistants and technicians, and anything computer-related, a component of most modern jobs. A large part of the problem is the de-emphasizing of vocational education in recent decades as students, parents, and policy makers embraced a “must-go-to-college” philosophy. In Boston, for example, the city’s only vocational high school, Madison Park Technical Vocational High School, has become one of the worst-performing schools in the state. Waiting lists are not the problem at Madison Park, which did not participate in the Northeastern survey, but rather the opposite. Enrollment has fallen sharply. The school recently welcomed its smallest freshman class in decades, about 150 students. Meanwhile, some 60 staff positions were vacant as the school year began. The headmaster, Diane Ross Gary, resigned abruptly Saturday after Boston School Department officials learned that she did not have proper certification. David Ferreira, executive director of the Massachusetts Association of Vocational Administrators, noted that the state has not built a free-standing vocational school in at least 30 years. While funding for vocational education has increased under Governor Deval Patrick, Ferreira said, it does not reflect the extra costs of running vocational programs, which can require expensive equipment and materials, whether lathes, lumber, steel, or computer-controlled manufacturing tools. But Gregory Bialecki, the state’s secretary of Housing and Economic Development, said the solutions are more complicated. They include overcoming societal stigmas that vocational schools are outdated and dangerous, or views that manufacturing is a dirty and dying industry. Some schools have difficulty attracting students to manufacturing programs, he said. Buck Upson, retired chief executive of Pioneer Tool Supply, a Western Massachusetts distributor of manufacturing equipment, said the competition for vocational school spots allows administrators to select top students, many of whom go to college, while those with imperfect academic or discipline records — arguably, those who might benefit the most from vocational education — are left behind. “The kids that need the break, that don’t have the option to go to college, are being bypassed,” he said.